The Grand Prix is an annual EU-wide contest, with more than 300 producers competing to become one of eight EU PiG Ambassadors. By telling us their innovative ideas and best practices, developed in response to industry-wide challenges, they are showing the rest of Europe the best of what they have to offer, and flying the flag for their country. The winning producer Ambassadors are invited to showcase their best practices in a range of ways, including talking to producers out and about in the industry. The Regional Pig Innovation Groups (RPIGs) also help the Ambassadors to produce virtual farm tours, photos and reports, shared on this website, within the relevant 'Theme' section, Health, Meat Quality, Welfare, Precision Production. Novel technology, thematic systems and predictive modelling. Tools, systems and methods of monitoring gut health. Novel approaches to ensuring appropriate gut health development. In some countries retailers ask explicitly not to use any feedstuffs that are derived from GMO raw material. Pig farms increasingly are object of public concern related to animal welfare, to environmental sustainability and to the use of anibiotics. 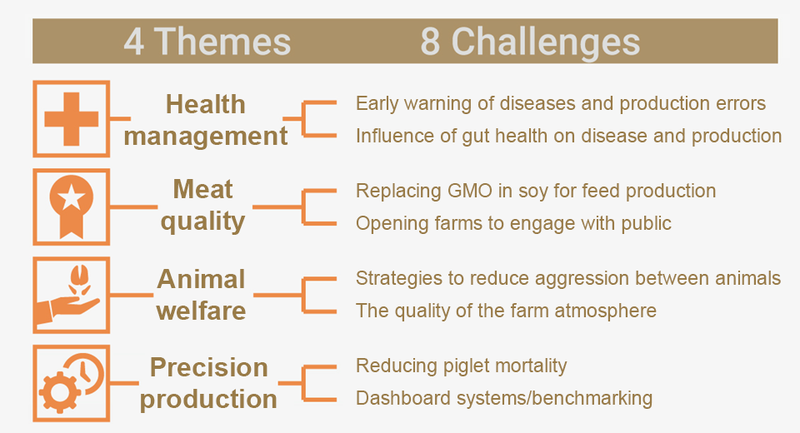 Management systems, novel techniques or technologies that lead to a reduction in the aggression between production animals at any stage of production. In connection with the health of the breeders and the animals. Still births or "mortality until weaning", also in hyperprolific sows - where do you gain the highest effect. (Nudging, motivation) systems to easily identify reduced performance increased costs - keep the production on track. The 2019 Grand Prix is now closed. Details regarding the 2020 Grand Prix will be available in due course. A panel of experts for each of the project themes then run a rigorous evaluation process, looking at technical and economic factors, to narrow it down to the top five best practices, for each of the eight challenges. The eight winners are then selected by RPIGs, project partners, and stakeholders, and awarded the title of EU PiG Ambassador. Producers are asked to suggest what they think future challenges should be through the Grand Prix application process. Please get in touch with your Regional Pig Innovation Group (RPIG) leader to find out more.